Kids Together International Playgroup for Schoolkids and Parents. Every 3rd Wednesday of the month from 2.30 – 4.30pm in the afternoon for kids 4 years and older. Nice to be in contact with children and Mum & Dads from all over the world and the Netherlands. The playdate will be at varied locations. 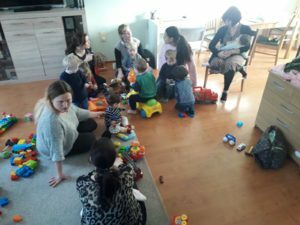 This is an English speaking playgroup for parents in and around Arnhem/Nijmegen for children between 0 and 4 years. Join us for play dates every Thursday from 9.30-11.30 am. No judgements, no expectations. Just relax and share experiences, have a coffee together and chat, while the children play ‘together’. If you fancy it, you can arrange or suggest fun activities also. Follow Arnhem Together’s Event section for details and join the Tots & Tea FB page for regular updates on the location of the meet.